I’m going to start this out with a confession: when I was in high school, and even a few times in college, I occasionally visited a tanning bed. Looking back, I can’t believe I did that; tanning beds are dangerous for everyone, but I’m a redhead. My skin is the color of a cotton ball in its natural state, and at its very darkest approaches something you might call “light beige” if you were in a generous sort of mood. It was downright stupid of me to go to a tanning bed, and I’ll never do it again. When I stopped visiting tanning beds, I looked for some other methods to darken my skin. I tried a few self tanners over the years, but I never used them much for a few reasons: they smell terrible, they’re messy, and they’re made from an unknown assortment of chemicals. When cutting down chemical usage, self tanner is a pretty easy thing to toss. After I stopped using self tanner, I pretty much just embraced my pale skin. I still believe that there is no shame in having skin that doesn’t tan, and most of the time I wear shorts and skirts with confidence. But it’s springtime now, and I have to admit that I have been wishing that I could add just a touch of color to my legs. They’ve been hidden all winter, after all. After searching around, reading reviews, and experimenting, I think I have a natural homemade self tanner that does exactly what I wanted it to do. My legs have gone from looking pallid to a touch golden, and dare I say it, sun kissed. Bring 16 oz. of water and 1 tablespoon of vanilla extract to a boil. Pour boiling liquid over tea bags and let steep for at least 8 minutes. 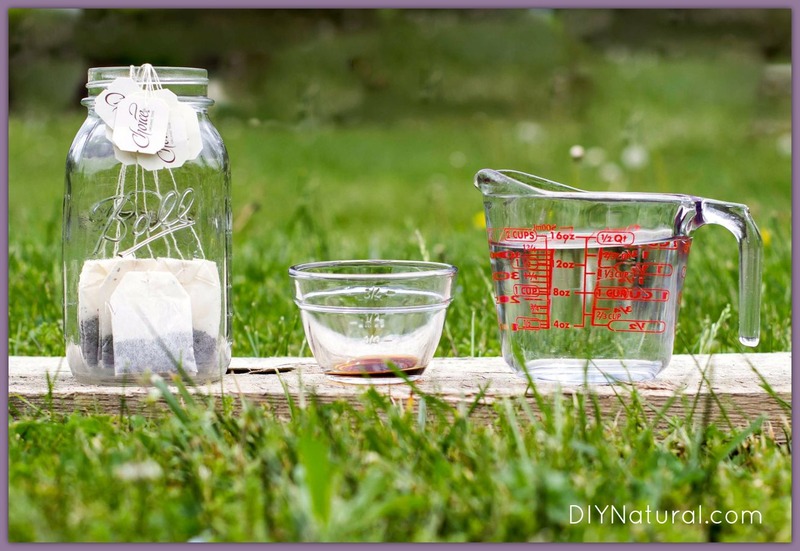 After you’ve removed your tea bags (and put them in the compost), give your DIY self tanner plenty of time to cool. This could take 30 minutes or more, but believe me when I tell you that you don’t want to spray nearly-boiling tea on your legs. You are not that tough. 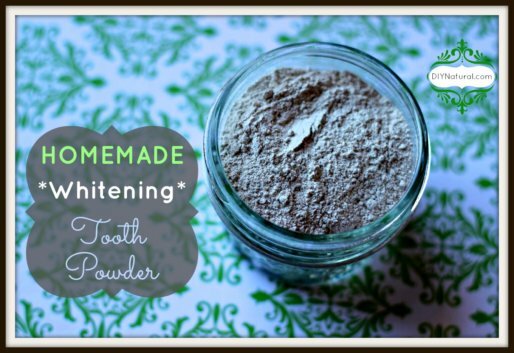 There are a few steps to take before you apply the homemade self tanner. First, make sure your skin is exfoliated. You don’t have to do anything fancy, but give the target area (legs or arms, probably) a good scrub with a washcloth a few hours before you need to use your tanner. I say this because I did not do it, and I wished that I had. I will next time. It’s also a good idea to moisturize your skin. Have you made your own lotion yet? This is a great use for it. Moisturizing your skin will make it easier to get a good, even skin tone. After your skin is primed and your DIY self tanner has cooled and been transferred to a spray bottle, it’s time to apply it. I used the simplest method I could think of: I sprayed the stuff on my legs and rubbed it in with my hands. When I had rubbed it on evenly and let it dry, I added another layer. I did this four or five times, which sounds like a lot, but the tanner dried quickly. I didn’t spend more than ten or fifteen minutes applying it. As I said before, I have a very light complexion. This particular recipe worked well for me, but darker-skinned folks might want something stronger. I used a ratio of 1 tea bag to 2 ounces of water, but for a stronger solution you could use a 1:1 ratio. I steeped my tea for 8 minutes, but steeping it longer would definitely result in a darker solution. One thing I would not do is to add more vanilla, though, because I think that adding much more would result in a sticky solution. It does! It really does. I’m not saying that my faux tan is going to cause people to ask me if I had a nice, sunny vacation, but I am saying that my legs are a darker color and I feel better about wearing shorts. My favorite thing about this homemade self tanner is probably that it smells so good. 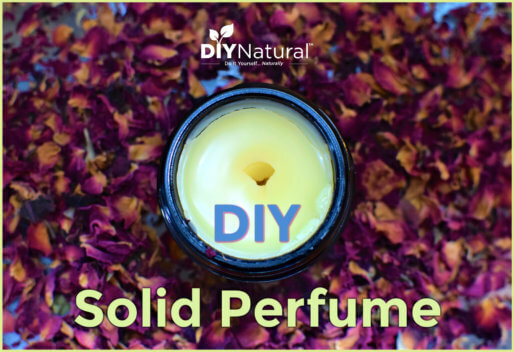 It’s not perfume or anything, but if you’ve ever suffered through the chemical smell of store-bought tanner, you will agree that this homemade tanner has a much more pleasant aroma. I’ll be honest: I do have two issues with this solution. First, it isn’t completely waterproof. It doesn’t rub off, but it didn’t last through the shower, either. Second, tea is perishable. This self tanner is best kept in the refrigerator in a glass container, but even when refrigerated it won’t keep more than a week or two. If you find that you aren’t using all of yours before it goes bad, consider cutting the recipe in half. Even considering those two caveats, I think this stuff is great. I haven’t been able to have tan legs in years. 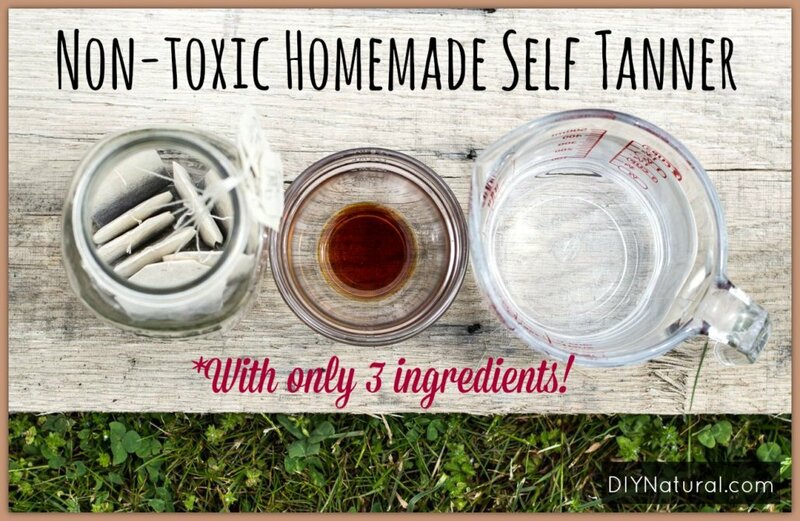 Since neither tanning nor chemical-filled, store-bought tanners are options for me, this DIY self tanner is perfect. It was easy to make, easy to use, and I plan to keep it around for the rest of the summer. Looks like you’ll be calling me “light beige” for at least the next few months. You know what? Your skin is tan even without self tanner. Like you haven’t seen my skin and I’m not even a redhead (but I have freckles). Question: The vanilla needs to be dark vanilla, right? I have both dark and clear. Appreciate the post. I remember using brewed tea with something in the 70’s when hot pants were popular. Would use it and lay out both. Thanks! Yes, it needs be dark vanilla for proper pigmentation. Thank you so much for all the posts that I have received since subscribing. You sound so down to earth and amazing. As to a comment above, this is one I will not unsubscribe from. I am going to try the self tanner tomorrow. Make it now, and leave the tea bags to cool overnight. When I bath tomorrow morning, I will scrub my legs and then put it on after that. THANK YOU AGAIN FOR YOUR POST. A word of warning. Vanila causes the blood vessels to open and allow medicaations applied topically to enter the muscles. Also, your skin is your largest organ–and if you have very dry skin, you could absorb a lot of caffein into your system. Ilike the idea–just be careful if you are sensitive to caffeine or any substance you put on your skin. I’m excited to try this. 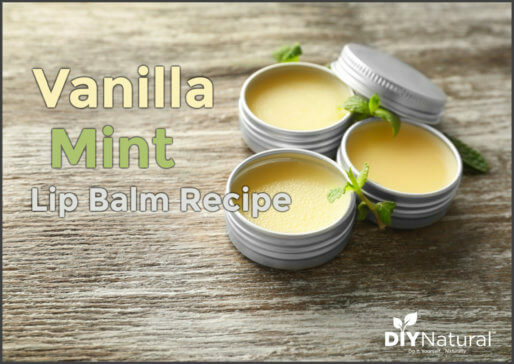 Just one question: does the vanilla help with the color, or is it just meant as a preservative or for smell? I just realized my vanilla is gone and my beans will need to soak for a long time before I get a good color. If the vanilla is necessary for the color, I’ll wait or buy more. If not, I’ll just use vodka. Thanks! I’ve never tried it without the vanilla, but I think it would be fine. I added mine mostly for the smell! Ok! I’ll try it and repost to let you know how it goes. Boiling my water now! How long does this fake tan last for after each use? Does it have to be used everyday? If I get in a pool will I have a big dark ring in the water around me? It lasts for a few days, definitely. You will not have a big dark ring around you in the water! I wouldn’t count on it to last all day swimming, but it won’t come off profusely, either. I loved reading your article. I have a daughter with very pale skin. She is so self-conscious about it that she refuses to wear shorts. And considering we live in the south, is almost unbearable for her. I have recently been experimenting with black walnut hulls as a dye for my ever graying hair. It works well, but stains everything it touches. I like the idea from another commenter about using coffee grounds. I have not yet been successful making my hair color into a gel, but am getting closer with the use of corn starch. Perhaps between the lot of us, we can come up with a more permenant and user friendly self tanner. I hope this inspires you to continue working on your tanner and gives you some ideas for future tanners. I’m a redhead too! Maybe this will help me from getting teased in the summer. I can sympathize with up Emry. I too am a red head that goes from white to red to white again all summer long. I have tried sunless tanning cream without much success and as you mentioned, I didn’t like the smell. While I haven’t ever used a tanning bed, I have resorted to a spray on tan treatment when I vacationed in Hawaii. Who knows what chemical were in it. Thank you for this natural approach to my white skin. Will the tea rub off/stain clothing? I haven’t had that happen, but I would test it out before trying white pants or anything. I’m definitely going to try this. I’m very fair skinned and hate wearing anything where my legs will be showing. I swear, people need sunglasses for eye protection when I do. Thanks for the recipe! I’m wondering if you could combine the self tanner recipe with the homemade moisturizer recipe to make a concoction that does double duty. Does the tea in the self tanner stain the skin or is it just a film? Thank you for this blog–I enjoyed reading it, and I feel inspired to do some experimenting! I think that’s a great idea. The reviews I’ve read online of tanners/moisturizers together weren’t great, but I’d say it’s definitely worth a try if you’re interested! First, LOVE your site!! KUDOS!! Great! Thanks for that idea! Love the candid nature of this article…great information from a very witty source! Great writing. I enjoyed reading this. 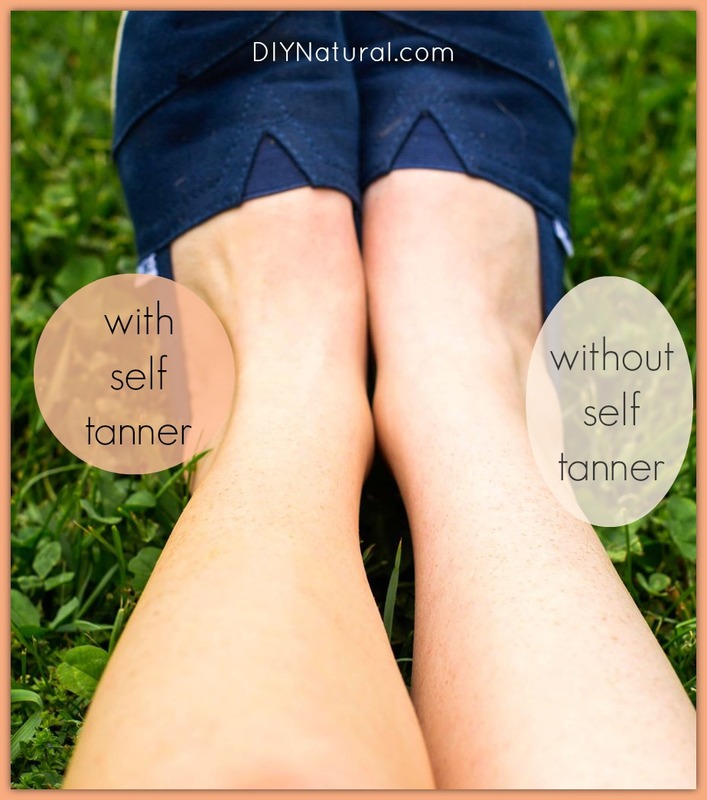 Even though I have no need for a tanner, this article kept my attention…..I’ve unsubscribed from a lot of similar blogs recently, but I’m keeping this one!